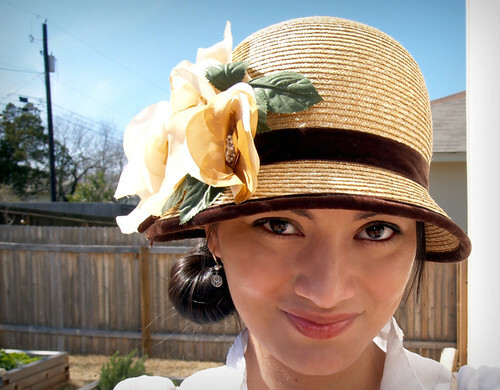 This hat made me long for a peach flapper dress, but since I am without, I had to improvise. But believe me, I'm not above buying a thrifted flapper-like dress just so my darling new hat has a worthy dance partner. I realized that hats are awesome because no matter how big I get or how terrible my hair looks, a hat will still fit and will still look smashing. I fully intend to buy at least two more summer hats from Hats in the Belfry. I'm excited that they're super high quality and made under fair labor conditions in the U.S. In other awesome news, today I had a call-back for the commercial audition I had last week. They paired me up with a different kid today, but she was pretty good, too. I feel like I did really well, but I'm a bit nervous as the casting folks decided to audition the kids' real moms, in addition to the handful of professional actresses they called back in. Fingers crossed! If I get it, this darling cloche will be my new lucky hat! Eight items for under $80? NO EFFING WAY.